10. 1991 Sterling 827SLi - This was a really nicely preserved 827SLi. It was owned by Dave Destler, the one time publisher of British Car magazine. I've always loved the look of these cars. 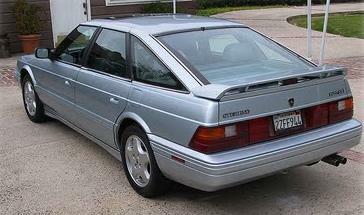 It's an update on the SD1 styling. Early Sterlings had well publicized quality control issues. Even though the 827SLi was much better built than the 825 sedan, few people bought them. They are a rare sight these days. This was an ex-press car. It was loaded with every available option and looked great. 9. 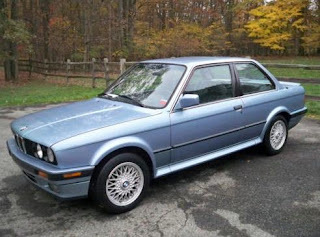 1989 BMW 325iX - The later E30s, with the smaller bumpers and the 170 HP 6, are great looking, nice performing cars. The iX, with all-wheel-drive adds surefooted to that description. This was a nice, well taken care of, 325iX. Here in New England, a 5 speed E30 that you can drive in all types of weather is the perfect everyday classic. 8. 1985 Maserati Biturbo - I'm tired of defending these cars. Yes, they are high maintenance cars. But so are most older exotic / semi-exotic cars. Would anyone call an old Lotus, Jaguar, Ferrari, Lamboghini, etc., a low maintenance car? No, of course not. But, I've listened to owners of those cars trash the Biturbo. This Biturbo was in good shape. It came with maintenance records and was being offered by a reputable dealer. It's an automatic, which may turn a few people off, but as reader Alden wrote, "Actually I always thought the automatic might be the better choice for this car. I think it is a version of the Chrysler Torqueflite, so replacements might be more readily available. Also there would be a very slightly less chance someone had over-revved the thing by missing a shift with the 5-speed." 7. 2000 Audi S4 "Biturbo" - I have an odd relationship with Audis. If any friend, acquaintance or stranger came to me and asked what I would recommend for a fun, high performance sedan, I would tell them an M3. Or, if they had a little more cash, an M5. I wouldn't even have to think about it. However, if my son, or anyone else I really love, asked me the same question, I'd recommend this car. The difference? Audi's quattro AWD system. It makes it almost impossible to get into trouble. On dry pavement, gravel, or snow covered roads, all you have to do is point it where you want to go and it gets you there. It gets you there very quickly, too. No fuss, no drama, no excitement. It's perfect. It's almost boring. It's still very cool. 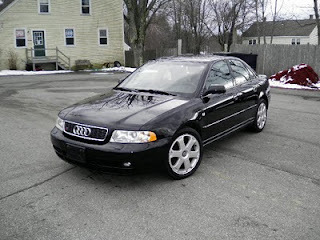 This car was a - thankfully - stock S4. It looked great in black. 6. 1986 BMW 535i - I love the E28s. They have a great, classic BMW look to them. The 535i is, in my opinion, the E28 of choice as a daily driver. In the original post, I described this car as a "a no nonsense version of a no nonsense car". It's true. It was a very clean, unmodified example. 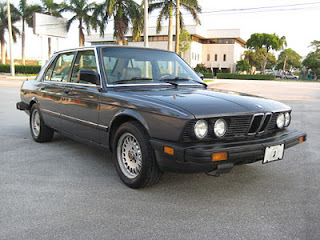 An E28 M5 would be a great car to own. However, if I was looking for something for to use as a daily commuter, a classic car that would be subject to stop and go traffic, parking lots, etc., this would be my car of choice. As regards the Maserati Bi-turbo automatic, I can't vouch for the Chrysler Torqueflite transmission, although I wouldn't be surprised if Maserati had plumped for this when the car was being developed. There simply aren't too many autos that can cope with such an abundance of power if not also torque than something American. 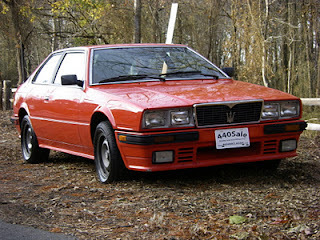 However, on the later versions, I know for a fact Maserati used an Aussie Holden (four-speed) automatic in the nineties Quattroporte, courtesy of the local distributor here in Sydney, one Tony Graziani, who pushed for it, as Maserati couldn't find anything suitable in Europe at the time. I always wondered if they might have gone to Mercedes to get their excellent (at the time) five-speed auto, which I think they were still using in the S-Klasse, including high-performance versions (like AMG). Anyways, the Aussie transmission was certainly robust enough, but frankly a bit laid-back and occasionally quite crude in its operation (a bit like us Aussies are ourselves, you might say!). It used to clunk and jerk around on gear-changes, particularly when under duress, and wasn't wholly fitting of a car with the kind of pedigree a Maserati might be perceived to have. Another point, and here is a bit of trivia to add to the equation: the name "Maserati", believe it or not, is actually Hebrew in its derivation, and means simply "conservative". Although i freri Maserati would have been quite obviously Catholic, they would have known about their distant ancestry, likely as Sephardi Jewry given the Italian corruption of their original Hebrew name. This would almost certainly have dated back to the time of the Inquisition in medieval Europe. Hence Maserati cars as a rule look quite obviously conservative and somewhat understated, belying as they do the scintillating power under the bonnet (or hood, as you probably say at home). Dave, have a great New Year. By the way, we're already well into 2012 as we're in the fast lane in Oz...! You should try it!